You are here: Home / Articles / What to do with Small Balances on Gift Cards? What to do with Small Balances on Gift Cards? The holidays are coming up and often times people give gift cards such as Visa Prepaid or American Express Prepaid gift cards. If you are like me, you often are left with a few dollars on the gift card. Sometimes you may have issues redeeming the card at certain stores if you don’t know the balance on the card. I have a solution for Amazon.com fans that is easy and will make sure you don’t waste any of your gift card. What I do with those small balances is purchase a Amazon.com virtual gift card and apply it to my Amazon.com account. I’m always finding great deals on Amazon or purchasing a book for Kindle here and there so these can really add up. Find the balance on your prepaid Visa or American Express gift card. You can check the back of the card to see what url to visit to find your balance. 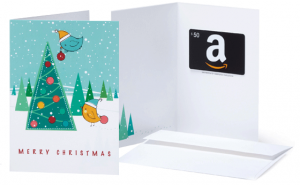 Purchase a gift card from Amazon in that exact amount and sent to yourself. Simply enter in your own email. Use that prepaid gift card to purchase the gift card. Shop Amazon and get a great deal plus use up those small balances! I love this because I don’t have to carry around a bunch of prepaid gift cards AND know the balances of the cards. I’m positive I can find something to spend the gift card on Amazon.com even if it’s cleaning supplies, food, Kindle books, or whatever! Right now, there will be plenty of holiday gift ideas that I can use my gift cards on! Thank you so much! That is the perfect solution for me! Thanks! My daughter has $2 and change on one card and she loves Amazon! I am going to try this because I do all my purchases on Amazon. I have Amazon Prime. Highly recommended. just did this – thanks! Awesome idea…thanks for sharing that! !